A lightning talk at the recent UKSG conference focused on Integrating Mobile Technologies into the Academic Library, based on the experiences of University of Surrey. In this guest blog post, Claire Gill and Claire Gravely share more information about some of the initiatives at University of Surrey Library to support staff deliver services, and to support users. Claire Gill is Virtual Support & eServices Developer, who became interested in mobile technologies as part of her role is to maximise the accessibility and usability of the website and e-resources. Claire Gravely is Information Resources Advisor, who was previously involved with e-resource management and access, which sparked an interest in access to information and resources through new technologies. After seeing an increase in the number of users with mobile devices such as smartphones and tablets we decided to investigate the different options available to the Library to support this usage. Our approach from the start has been to focus on what we can do or change now. This allowed us to take a step back from whether or not we would be able to create and support a mobile app, which seems to be all the rage, and to focus on what was in front of us and the quick wins we could achieve. A first step was to get Library staff introduced to the technology. We held some initial training sessions in which staff were invited to come along and try out a few different tablets and e-readers. This allowed them to have a play with the devices and they were given some basic instructions to show them how a user might access some of our resources through these. A number of iPads have now been integrated into the staff workflows. We have an iPad for troubleshooting and testing which is used by web development and the e-resources team. 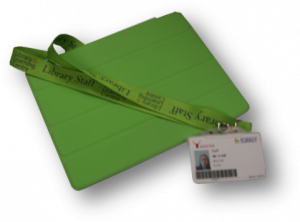 The user support team have recently implemented a roving service which now also uses iPads which have been colour coordinated with library staff lanyards to give a more professional presence around the library. The academic liaison librarians have started to use iPads to support students, and also to take to meetings across campus – they have found them particularly useful to show changes to the website and new resources to their faculties while out and about. We wanted to find out what our users wanted from the Library on their mobiles, so we put a poll on our blog, and then held two focus groups. What came out overwhelmingly was that students didn’t really care where information came from – the Library, or other parts of the University – and wanted an app that would combine all information in one place. We have therefore been holding talks with the University’s Digital Platforms team looking at creating a University-wide app with input from all departments. In the meantime we have been doing the things we can do in the Library. We have implemented QR codes (we use bit.ly to generate these, as we can get statistics). We currently use these on posters, and electronic displays, to link to further information online, or to the contact details of our Academic Liaison Librarians. While the statistics show a relatively low usage of these, the effort involved in creating them is negligible, so we feel it is worth it. Another easy implementation – just changing a setting – was the mobile version of our Library Catalogue, which is now available for students to search for and renew books on the move – this was a very popular request that came out of the focus groups. We have created mobile friendly versions of our opening hours page, and of our room bookings site – the latter of which was another need highlighted by the focus groups – and we are working on getting this linked to the physical rooms by use of qr codes. We have investigated the different apps available for resources we subscribe to and are working on a new webpage to promote the most useful ones to students. This entry was posted in Guest blog posts and tagged claire gill, claire gravely, university of surrey on May 29, 2013 by Jo Alcock. Branded QR codes – let’s make them interesting! Bookmarks der letzten Woche (KW 37, 2013) | Büchereizentrale Niedersachsen... on Branded QR codes – let’s make them interesting!